We know how to create an Auto-number Field in a Table to generate Unique Sequence numbers automatically for the records added to the Table. We know how to create Sequence Numbers for data lines on Reports. On Reports, create a Text Box in Detail Section of the Report, write the expression =1 in the Control Source Property and change the Running Sum Property Value to Over All or Over Group. If you need sequence numbers for each Group separately, depending on the Sorting and Grouping settings on the Report, then the Over Group option must be set in the Property otherwise Over All for continuous numbers from start of the Report to the End. If you want to create Running Sum value of a Field, like Quantity or Total Price, then set the Running Sum Property value as explained above. For more details on Running Sum as well as creating Page-wise Totals on Access Reports visit the Page with the Title: MS-Access Report and Page Totals. But, Auto-numbering in Queries looks somewhat strange to ask for unless you want to use the Query result for display purposes or the output created from that should have sequence numbers for some reason. Any way this requirement was raised by a participant in a MS-Access Forum on the Net and nobody (including me) could give a clear cut solution except some alternatives. I chipped in with a solution of my own, even though I was not happy with that either. The Access User who has raised the question in the Forum made direct contact by sending an E-mail to me asking for a solution. This made me thinking again on that topic and did few trial runs of few simple methods. Finally I could come up with a Function that can do the trick and I am presenting it here so that you can also use it, if you really need it. It is important to know the usage of the QrySeq() Function in Queries in a new Column to create Sequence Numbers. The Function must be called with few Parameter Values using the values from the Query itself. So, before presenting the VBA Code of the Function I will give some details of the Parameters. The QrySeq() Function need three Parameters. The First Parameter must be Unique Values available from any Field in the Query. Second Parameter is the Column Name of the first parameter in Quotes. Third Parameter is the Name of the Query from where you call the Function. The Query, from where the QrySeq() Function is called should have a column of Unique Values, like Autonumber or Primary Key Field. If this is not readily available then create a Column by joining two or more existing fields (like NewColumn:([OrderlD] & [ShippName] & [RequiredDate] & [Quantity] from the existing column values and ensure that this will form Unique values in all records and pass this Column value ([NewColumn]) as first Parameter. The first Parameter Column Name must be passed to the Function in Quotes ("[NewColumn]") as second parameter. The Name of the Query must be passed as third parameter. 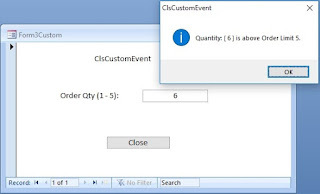 NB: Ensure that you save the Query first, after every change to the design of the Query, before opening it in Normal View, with the Function in place, to create the Sequence Numbers correctly. Now, the simple Rules are in place it is time to try out the Function.
' - in normal View. MsgBox Err & " : " & Err.Description, , "QrySeqQ"
Import the Orders Table from C:\Program Files\Microsoft Office\Office11\Samples\Northwind.mdb sample database. Select Save from File Menu or click on the Save Toolbar Button. Open the Query in normal view. 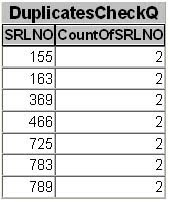 Check the SRLNO Column for Sequence Numbers. Here, the OrderID in the Orders Table have unique field values and we could easily get away with the Sequence Numbers correctly in SRLNO Column. Let us pretend for a moment that we don't have a single field with Unique Values in the Query. We must create a Column with Unique Values by joining two or more Columns available in the Query and pass it to the QrySeq() Function. Let us try such an example with the Orders Table. Copy and Paste the following SQL String into a new Query and Save the Query with the name AutoNumberQuery2. Open the Query in normal View to check whether the Serial Numbers were created correctly or not. When there are several records it is difficult to check whether the Column Values we have passed to the Function are really unique and the Serial Numbers generated have no duplicates in them by manually checking through the records. Instead, we will take a Count of Serial Numbers appearing more than once in the Records, if any, with the use of a Total Query using AutoNumberQuery2 as Source. Open DuplicatesCheckQ Query in Normal View. You will find the following result showing SRLNO Column having the same number appearing more than once in the records indicating that the Unique Column Values we have created for the Function are not really Unique and have duplicates in them. This can be rectified only by adding more Column Values to the NewColumn expression to eliminate the chance of ending up with duplicates. This method is only an alternative in the absence of an AutoNumber or Primary Key field Values and not with 100% percent success rate because when you add more records to the Source Table it is likely that it can fail again. In this case the only solution is to join more fields to the expression in NewColumn so that we can reduce the chance of failures. Now, to correct the above Query add the [Freight] Value Column also to the NewColumn expression. Or Copy and paste the following SQL String into the AutoNumberQuery2 Query overwriting the earlier SQL string in there and save the Query. Open the DuplicatesCheckQ Query again to check for duplicates. If the result is empty then the Sequence Numbers generated will be correct. If you have a different solution to this problem, then share it with me too. I don't need a refined version of the above Code or method but a different approach to arrive at the same or better result. I'm another developer who can use this query info. Thank you for putting this together! Can you help me with this and what was wrong? I copied and pasted your code. THANK YOU! Really want to get this to work. I have copied the Code and SQL String from the Web Page and tried out again. I could not find any problem with it. Are you sure that you have given the Query Name correctly as third Parameter of the Function? a.p.r. pillai, thanks for the Link. It worked nicely! thanks its works fine!!!! but i have some problems when i used some criteria based on text field in a form (my query filter based on that) its wont work the value of "SRL" number turning into zero values do you have any sugest ? i need the auto number because its the only way i know to have pagination report(in report view) on ms acces or do you have another suggest to make it? "im from indonesia sorry if i had bad english"
It will not work with Queries that references Form controls or Parameter Queries as criteria. Create an output Table by filtering the data by using above methods and create a separate query with the output table and call the function QrySeq() in a column in this final Query. I have been needing this utility for quite some time but with an additional level of grouping. I have to begin re-numbering within a table everytime the PROPNUM changes. Basically the data needs to look like below. Notice the months are being counted sequentially. Can anyone help with providing code for this? MANY THANKS IN ADVANCE! I have tried to use this function in my own database but I'm getting an error 13: Type Mismatch on QrySeqQ. The field I'm using as the parameter is a text field. Would this cause a problem? You may use any field (numeric or text) or join several fields and use it as parameter to the function. There is only one condition the parameter value must be unique. The first parameter [ORDERID] is the data field reference having unique value (numeric or text) in it. If you don't have a single field with unique values then join one or more fields and create a separate column like: myKey: [EmployeeID] & [FirstName] & [LastName] then give the column name [myKey] as first parameter. Note, here EmployeeID is numeric field and FirstName and LastName are text. When all the three are joined the final result is text. Second Parameter is the name of the first parameter column enclosed in Quotes: "myKey". If you left a space between the words my Key then enclose them in square brackets "[my Key]", otherwise the  are not needed. Third Parameter is the Query Name, from which you are calling the function, in quotes: "Query4". I can setup the code ok, but wheni run, I am getting 0 on every record. I used this field to be the field to check, that when it changes, reset the serial to 0. For this, I used a field that is repeated on each record, unti a change. I am using customer addresses as an example. The calculated field is custid+shipto and the ctrlfield is custid. Sorry, worked out the last question I had, although I have another. How can I start the numbering at 1 instead of 0? THANK YOU, THANK YOU, THANK YOU - I have been banging my head against this issue for 3 days and attempted numerous solutions detailed on-line. Your technique does exactly what I needed.